Banking data that came out earlier this month surprised analysts when they saw approved loans for residential property surge 49% in March from February. There was still a lot of fear in the stock market in March or earlier, when buyers applied for loans, but the behaviour of home buyers is different from that of businesses or market punters. Home buyers are sensitive to interest rates, especially when they fall to base lending rate (BLR) minus two percentage points, and when job losses are not extensive here. Their behaviour is in contrast to businesses that might not borrow, and stock market investors who might not invest, even when interest rates are low. 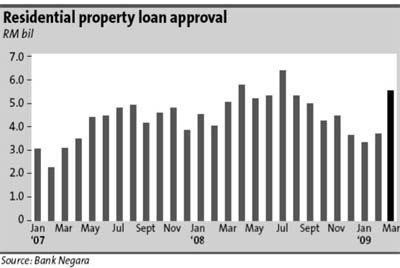 The March loans data invalidated the perception that housing sales were robust in a few pockets of projects only. The data showed sales must have been brisk in many property projects. To some extent, the upbeat data could also have been due to approvals for refinanced loans as borrowers sought the new, lower rates. But, remarks from property developers support the case that it was also partly due to a rebound in housing sales. Home buyers were also attracted by an interest-free loan package that S. P. Setia Bhd is credited with introducing in the industry. SP Setia calls its scheme the 5/95 Home Loan Package which is offered in an arrangement with three banks. Under this package, buyers pay a downpayment of 5%, and pay interest on the bank loan of 95% only after the house is completed. Its CEO Tan Sri Liew Kee Sin told the media last month sales under the scheme had reached RM500mil from mid-January when it was launched. That’s an average of about RM170mil a month over the four months, a marked increase from RM62mil in October last year, according to an analyst. It should be noted that sales as referred to by the man-in-the-street are understood differently by analysts. For the man-in-the-street, sales are made when a house is sold, that is, when a sale and purchase agreement is signed. For analysts, sales are progressively booked into the profit and loss accounts only after the house is gradually constructed and billed to the buyer. Current conditions are a marked change since November when a brokerage summed up its view as “No light in sight,” and at that time, analysts preferred landlords, companies that owned investment properties, over developers. That preference has now been reversed, with analysts preferring developers over landlords. That’s only to be expected in view of sales recovery although sales are generally below that of 2007 when high-priced bungalows sold like hot cakes. Since SP Setia’s launch of its 5/95 loan package, many other developers have introduced their own financing packages to attract buyers. Mah Sing Group Bhd offered its own financing scheme shortly after SP Setia while IJM Land Bhd and Sunway City Bhd introduced their own home loan plans last month. Likewise, Sime Darby Bhd’s property division promoted its Parade of Homes programme from March, and since then it has drawn sales of over RM600mil, the company said in a statement last week. LBS Bina Group Bhd also reported that buyers have returned. The company said late last month the latest launch of a new phase in its Bandar Saujana Putra – Iris Garden – was 85% sold within two months. The financial results of developers in the first quarter may be weak as their revenues would be based on sales made some months ago. It would only be later this year that revenues from sales made under the various financing packages would be recognised in their profit and loss accounts.